Long noncoding RNAs (lncRNAs) are involved in diverse biological processes and play an essential role in various human diseases. 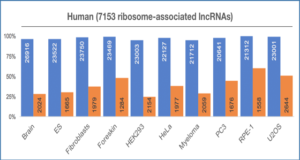 The number of lncRNAs identified has increased rapidly in recent years owing to RNA sequencing (RNA-Seq) technology. However, presently, most lncRNAs are not well characterized, and their regulatory mechanisms remain elusive. Many lncRNAs show poor evolutionary conservation. Thus, the lncRNAs that are conserved across species can provide insight into their critical functional roles. Here, researchers from the University of Arkansas at Little Rock performed an orthologous analysis of lncRNAs in human and rat brain tissues. Over two billion RNA-Seq reads generated from 80 human and 66 rat brain tissue samples were analyzed. 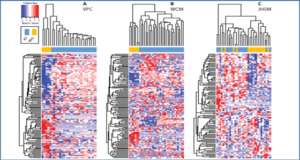 Their analysis revealed a total of 351 conserved human lncRNAs corresponding to 646 rat lncRNAs. 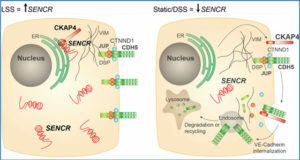 Among these human lncRNAs, 140 were newly identified by this study, and 246 were present in known lncRNA databases; however, the majority of the lncRNAs that have been identified are not yet functionally annotated. 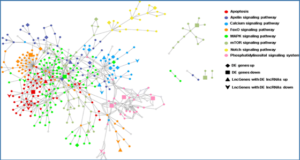 The researchers constructed co-expression networks based on the expression profiles of conserved human lncRNAs and protein-coding genes, and produced 79 co-expression modules. Gene ontology (GO) analysis of the co-expression modules suggested that the conserved lncRNAs were involved in various functions such as brain development (P-value = 1.12E-2), nervous system development (P-value = 1.26E-3), and cerebral cortex development (P-value = 1.31E-2). They further predicted the interactions between lncRNAs and protein-coding genes to better understand the regulatory mechanisms of lncRNAs. Moreover, they investigated the expression patterns of the conserved lncRNAs at different time points during rat brain growth. 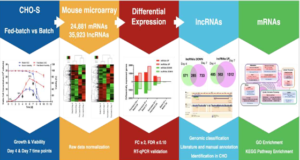 The researchers found that the expression levels of three out of four such lncRNA genes continuously increased from week 2 to week 104, which is consistent with their functional annotation. This orthologous analysis of lncRNAs in human and rat brain tissues revealed a set of conserved lncRNAs. Further expression analysis provided the functional annotation of these lncRNAs in humans and rats. 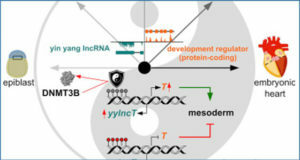 These results offer new targets for developing better experimental designs to investigate regulatory molecular mechanisms of lncRNAs and the roles lncRNAs play in brain development. Additionally, this method could be generalized to study and characterize lncRNAs conserved in other species and tissue types.